Today in History–October 8–the Library of Congress features the great Chicago fire, which began on this day in 1871. The fire took at least 300 lives, left nearly a third of the city’s residents homeless, and leveled more than 18,000 structures (Encyclopedia of Chicago). 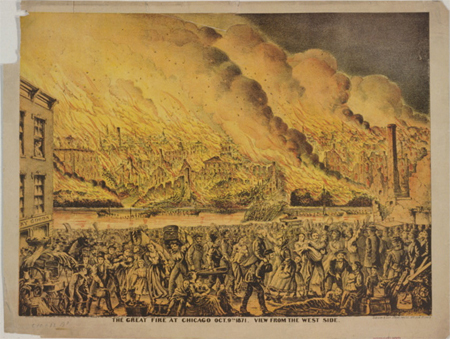 Learn more about this fire and others that burnt on the same day in Michigan and Wisconsin by visiting the Today in History section, then click the links below to access more information and resources related to the Chicago conflagration of 1871 and the great city of Chicago. The lost city! drama of the fire fiend!